Hello there lovelies. Thank you for popping by the blog. Fall has finally arrived! We are in the mood for pumpkins, falling leaves, earl grey tea, and big cozy sweaters. Today we are going to talk about velvet. In particular, velvet ankle boots. There is an assumption that this material is only for evening attire, but we assure you that it’s great for daytime too! Take a look at 3 options of velvet boots we have styled for you. These boots from Hudson are fabulously fun. They collaborated with Liberty London to create a beautiful paisley velvet print. The wood heel adds a finishing touch. We would wear these with our favorite jeans and a motorcycle jacket or embellished jean jacket. The bold oversized coat is bigger than ever. Whether you are wearing a colorful brocade, quilted, tapestry or heavily embroidered and embellished, the velvet ankle boot is the perfect boot to pair with these fabrications. We would wear our blue re-souL bootie with our favorite statement coat. Long cardigans and long wool vests are still going strong in fashion. Update your look with a simple black velvet bootie. Perfect with leggings or leather pants, but would also look fantastic with tights and a dress. What do you think? Ready to try velvet boots? Thanks for stopping by and if you would like to see some other seasonal options for your feet, visit our shop here. Hi there! Spring is not even here yet and we can’t help ourselves, we’re dreaming of warmer days, and of lighter layers of clothing. For today’s “what to wear Wednesday”, we are going to style a shoe boot or “shootie”. It’s the perfect transition footwear to go with almost anything in your closet. You’ll see what we mean, keep reading. 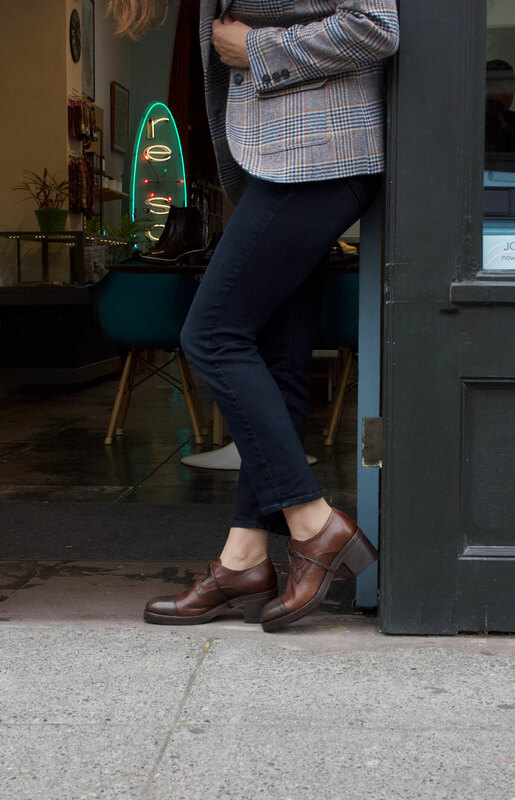 We love the idea of wearing shoe boots with cropped and tailored trousers. Now that pant silhouettes are starting to widen out a bit, we think a fresh way to accessorize them is with our re-souL “Shelley” shootie. The weight balances out the look and the heels give you just a little bit of height to visually lengthen the leg. Feel like wearing these with a dress? Not a problem. These will be fantastic with a loose fitting shirt dress or a midi-length skirt. You can wear these with or without tights. Just think of it as an alternative to the dress pump in your closet. But can you dress these down, you say? Yes, you can! They will look super chic with your favorite pair of skinny jeans or leggings. Add a long cardigan or oversized pullover and you are set to go. So how would you style our Shelley shoe boot? We’d love to hear from you! Thanks for stopping by and if you would like to see some other shoe styles for women, visit our shop here. On Wednesdays, we’ll answer the on-going question: “What do I wear with these?” It’s a question we get quite often here at the shop and we love giving suggestions when helping our customers. This week we handed the styling reigns over to Mellicia Marx of Poplin Style Direction. Mellicia is a personal stylist who helps individuals look their best through easy, friendly, no-pressure styling. She can help you buy a new wardrobe, or edit what you currently own, or both. She’ll even go thrift shopping with you! So naturally we were thrilled for her to style her favorite boot from the re-souL collection. You may have seen our Iris boot in last week’s post. But, you can never have too much of a good thing, right? Plus, we love Mellicia’s styling, so without further ado, take it away Mellicia! It used to be that the cool kids wore silver, never gold. Then, something changed. Now, it’s all gold all the time. There was also a day when a classic black boot was your go-to. That time has passed. Now, it’s all about the unexpected. Whether you opt for a neutral, like green or blue, or try a surprising heel, it’s time to dive into a statement boot that is shockingly practical. For me that boot is metallic and the Iris from the re-souL collection is just right. The color is more subdued, which is just right when you are searching for something cool and not overly flashy. Of course, it’s crazy functional for walking up and down the hills of Seattle. So, it’s clear you need this boot. Now, how to style it? I’m all about embracing your personal style and ensuring that your clothes communicate who you are. So, let’s begin with your very own Iris boots in bronze. Feel free to layer a leather jacket over top with any of these options or wear them sans cover-up. Cecily dress by All Saints. 1. With a compelling casual dress. I like neutrals with metallics and this cozy option is edgy and functional. Layer it up with leather leggings or distressed jeans or try it solo. 2. With a super feminine dress. There’s nothing like the balance of hard and soft. A girly piece paired with sturdy, hip boots is a timeless approach. Elevate the look with metallic boots instead of black and feel your fashion-forward self come through. Veronica Beard ‘Socal Trench’ Vest. Nordstrom. 3. With a long vest. A great strategy to simplify your life is to find boots that work well with a specific coat or vest. That way you can finish off every outfit effortlessly. Even the most basic of outfits is much more stylish with the right shoes and outerwear. If you find styling vests challenging, feel free to check out my post on the subject. I’m dying to hear how you style them. Please share! *Something special for re-souL customers: Purchase a package with Poplin Style before November 15th and receive an additional hour of service for free. That’s a $150.00 value. Reach out. Let’s talk boots. With the deep rich colors that the Fall Season always brings, and the continuation of the ankle boot trend, we think that metallic boots are a fantastic way to add some oomph to your wardrobe. These Kupuri black metallic ankle boots are the perfect alternative to the pump. Plus they’ll keep your feet a lot warmer than an exposed pump or heeled sandal. We would wear these with dresses and wide leg pants. They would look great with or without hosiery. Our very own re-souL ankle boot would look amazing with your favorite jeans and a chunky sweater. Because the bronze color is neither warm or cool, you could wear these with the full spectrum of color. Think of it as a neutral. These will look great with monochrome colors, jewel tones or warm rusty browns and mustard yellows. What do you think? Ready to try some metallic boots? For more metallic shoe options visit our website here. Now that we are into the thick of the season of cooler temperatures, pumpkin flavors in about almost everything, and sweater weather, we think you need to know what the top 3 trends are for right now. When you are not in the mood for your tall boots, may we suggest a chunky heel oxford to wear with your tights and dresses? Craving a little bling? We suggest a metallic shoe to bring just enough shine and sparkle to your cozy knits. Swap out those warmer weather slip-ons for an everyday ankle boot to keep your feet warm and comfy. If you would like to see more chunky heels, metallics or everyday ankle boots, visit our shop here.